Is Hoag’s Object a Dense Plasma Focus? What force swept away the stars and formed this 120,000 light-year-wide ring in space? This could be one of electrical energy’s protean forms. There are places in the cosmos where stars form up into ranks that stretch in lines for thousands of light-years. Elsewhere, rings of stars can be found encircling compact structures that have been measured at over 10,000 light-years in diameter. Art Hoag discovered the galaxy that bears his name in 1950 and by conventional redshift-equals-distance calculations, it is approximately 183 megaparsecs away in the constellation Serpens. The ring of “young” blue stars is notable, as is the dense core and the hovering swarm of globular clusters that lie in the center of the formation. There is an obvious swirling shape that radiates outward in the same way as that from the Cartwheel Galaxy in the constellation Sculptor. 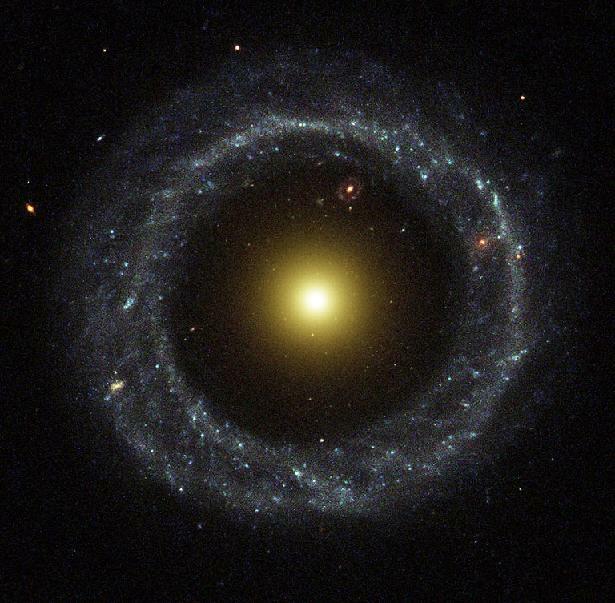 The filaments that connect the core with the ring in the Cartwheel Galaxy are missing in Hoag’s Object, although they could be radiating in dark current mode. The Milky Way Galaxy contains over 200 billion stars in its spiral arms and its nucleus. There have also been recent observations by scientists from the Sloan Digital Sky Survey (SDSS) indicating that a torus of additional stars is surrounding the Galaxy at a distance of 120,000 light-years. Most of the stars discovered by SDSS are invisible to visual platforms because they are in the same plane as the Galaxy, itself. However, the stars have been detected using infrared and x-ray instrumentation that can “see through” the obscuring dust. 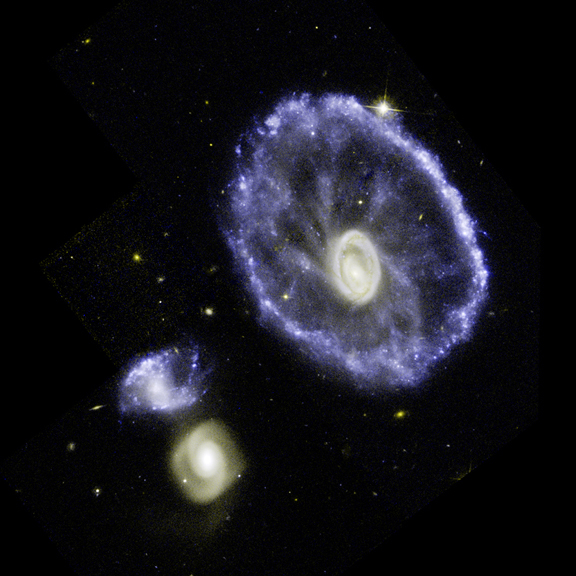 So, what causes galaxies to develop rings? Her colleague in the project, Brian Yanny of FermiLab wrote: "This ring of stars may be what's left of a collision between our Milky Way and a smaller, dwarf galaxy that occurred billions of years ago." His conclusion is that gravity from dark matter is sustaining the ring of stars around the Milky Way. By definition, those same forces are what cause the more dramatic structures like Hoag’s Object to appear – galactic collisions over billions of years moderated by gravity and unknown energies. Is there another way to address the issue that takes into account the electricity that flows through the cosmos and the magnetic fields that it fosters? It is possible that the stellar halos are actually examples of a dense plasma focus penumbra with Hoag's Object being the most dramatic example. 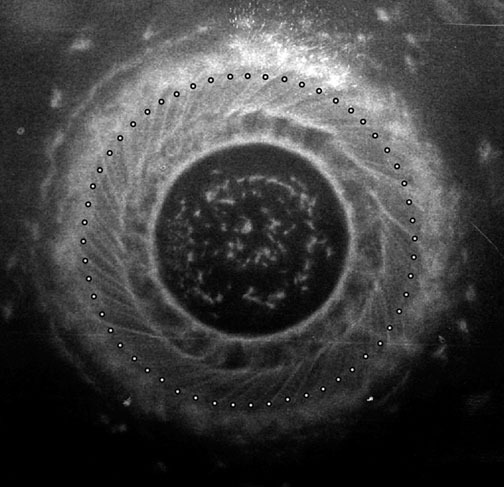 Images taken from experiments using a “plasma gun” offer a direct analogue to the “pinch zones” surrounding the discharge from Hoag’s Object. 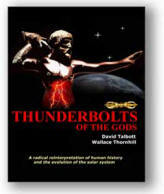 “The earth, the sun and many stars possess general magnetic fields. It is possible that interstellar clouds are magnetized, that spiral arms have regular magnetic fields, and that galaxies also have general magnetic fields. Even if the views of different authors are still conflicting, it seems reasonably certain that interstellar matter is usually magnetized. This makes is likely that there should be some very general process which produces magnetic fields in fluid bodies as different as the earth’s fluid interior, the stars, and interstellar matter. The energy required for magnetization can easily be drawn from the kinetic energy of internal motions, but the difficulty is to find a workable mechanism from the production of magnetic fields.” (Alfvén, H. “On the Origin of Cosmic Magnetic Fields”, Royal Institute of Stockholm, October 28, 1960). The dense plasma focus device, or “plasma gun” provides the precise mechanism by which cosmic electric currents can influence the evolution and morphology of space structures, whether they be moons or galaxies (See Peratt, A. L. and Dessler, A. J. “Filamentation of Volcanic Plumes on the Jovian Satellite Io”. Astrophysics and Space Science (ISSN 0004-640X), vol. 144, no. 1-2, May 1988, p. 451-461). Birkeland current filaments are the “transmission lines” through which electricity is conducted in the universe. Just as the helical strands from the core of Galaxy NGC 3079 are an indication that electricity is discharging from its nucleus, the swirling toroids that constrain the “young” hot stars in the halo of Hoag’s Object are a red flag to Electric Universe theorists. One of the signature phenomena in a dense plasma focus is the helical strands of energy that surround a powerfully radiating arc-mode discharge and a dark-current torus. The strands are helical magnetic fields that confine the electrified plasma and act like power lines in space – Birkeland current filaments, in other words. That phenomenon is present In the plasma gun discharge that makes up Hoag’s Object. It may be that there are 28 filamentary strands (or 56, or 49 or some other number discussed by Alfvén, Thornhill, Peratt and others) in the penumbral cloud of stars and nebulae that have been energized by the gun – the exact count is difficult to determine in the images that are available. But, with the other factors and the way that electricity behaves when it flows through magnetically confined plasma, the Electric Universe model of galaxy formation appears to have been lent further credence by this observation.